There is a very sharp cut off between completely overcast skies and clear skies. This cut off will work south and east through the day, but it may not make it through the southern Finger Lakes before moving back north late this afternoon. So, while some areas may enjoy lots of sun today, others may see very little. The one draw back today will be the winds. Some gusts over 20mph are possible, especially further north and west. Showers will move in tomorrow morning, followed by some steadier, heavier rain in the afternoon. Temperatures should stay warm enough to keep our precipitation all rain until Friday. Also, a big THANK YOU to those who have participated in my Fall Fundraiser so far. I greatly appreciate your generosity. 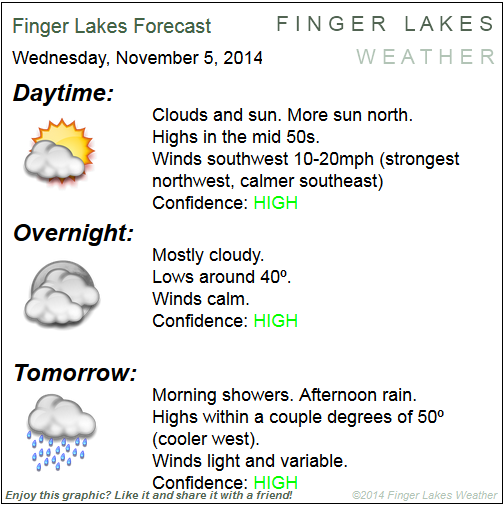 Please consider making a small donation to help Finger Lakes Weather continue to grow! Click the image to be taken to the Fall Fundraiser page! Thank you for your generosity!